Elite is a cult computer game, a space simulator with economic strategy elemenents, released by Acornsoft in 1984 for BBC Micro and Acorn Electron computers. Soon Elite was ported to many other machines. Part of the versions appeared on the market under Firebird trademark. The name of the game reflects one of the goals of a player - to achieve the highest military rating, Elite, starting from Harmless, going through the ranks Mostly Harmless, Poor, Average, Above Average, Competent, Dangerous, Deadly. "Elite" had launched a whole new game genre - Space Trading. Games of this genre combine space battles with transporting basing on the principle "Buy low, sell high". What is more the gain from sale is used to improve spacecraft. The first version of the game was developed by Cambridge University students David Braben and Ian Bell. The development process started in 1981 and in 1984 two versions of Elite for BBC Micro computer were finished: on tape and on disk. The tape version occupied only 22 kB of memory while the game on disk was bigger and included several secret missions and larger variety of space ships. The game was ported to Acorn Electron and in September 1984 it was released in three versions under Acornsoft brand. Later the games of the same name appeared for ZX-Spectrum (1985), Commodore 64 (1985), Apple II (1986), Amstrad CPC (1986), Atari ST (1988), Amiga (1988) and MSX (1988). Two official versions for IBM PC exist: Elite (CGA, 1987) and Elite Plus (VGA, 1991). Elite game for PAL edition of NES was released in Europe in 1991. Facts tell us that there was no NTSC NES version at all. Elite online has become one of the first games that use frame 3D graphics on personal computers. Another innovation was including of fiction novel of Robert Woodstock "Dark wheel" in the game package, which put a player in the way of the game. From the novel a player knows about mysterious death of main character's father, about how this character gets his spacecraft and about lost planet Raxxla. You can play Elite classic directly on this page. 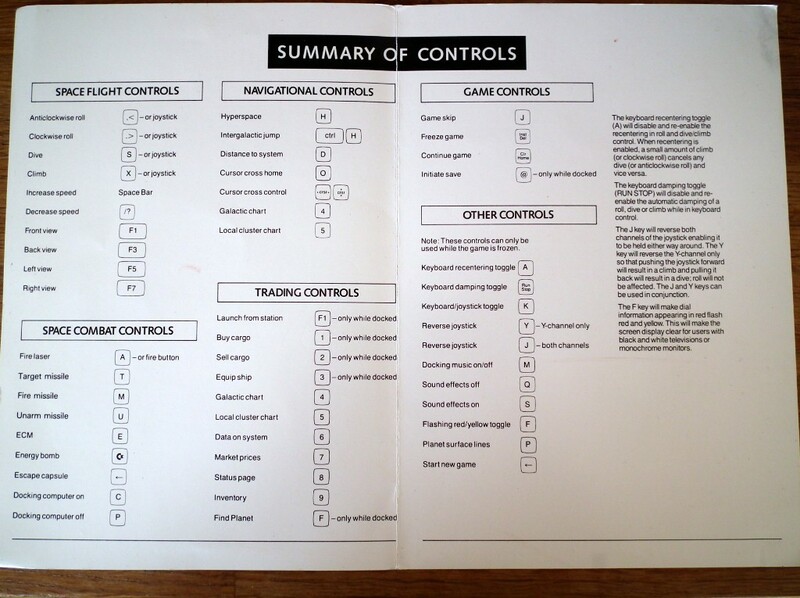 Please use the following controls to play Elite Game Online.